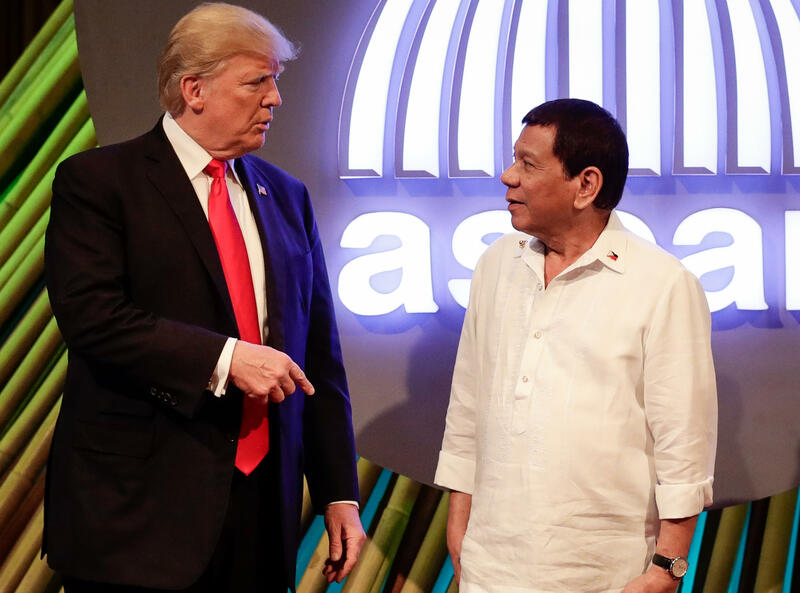 President Trump asked Philippines President Rodrigo Duterte if the Philippines has the death penalty when they met last month in Denang, said the Philippines Ambassador to the U.S. at the embassy Monday. Duterte told Mr. Trump he wanted to bring the death penalty back to the country. Duterte has already stated this intention multiple times. Ambassador Jose Manuel Romualdez described joint efforts on counterterrorism as the focal point of the U.S.-Philippine relationship in the coming year and said the Philippines appreciates the U.S. support for drug reduction programs. When asked what he meant by that, he indicated there has been "a lot of cooperation between our law enforcement agencies and the United States." He said that the U.S. continues to pass on information related to drugs and that "has definitely helped" the Philippines fight drugs. Mr. Trump did not publicly come out against Duterte for allegations that his war on drugs has, according to groups such as Human Rights Watch, violated human rights. CBS News reached out the White House for comment but didn't immediately hear back. When CBS News reported on the drug war earlier this year, Filipinos expressed fear of the Philippine National Police (PNP) as a result of their aggressive and questionable tactics used during the drug crackdown. A hitman told CBS News that the police are paying him to murder drug users, and he believes that money comes from the president. Romualdez indicated that the actions of the policemen are being closely studied by the government. "The situation that we have as far as the drug issue is concerned is so big that we -- the president has incessantly continued to go after all these criminals. And as a matter a fact just yesterday he dismissed 90 police officers of the force," said Romualdez. "We are also admitting that there has been some lapses in this drug war especially with the police force." In October, Duterte ordered all of the anti-drug community operations to be handed over from the PNP to the Philippine Drug Enforcement Agency (PDEA) in what he deemed an effort towards "pinpointing precise accountability." That pause has now been lifted and the police are back on their operations, with the added change that they must consult with the PDEA. The Philippine economy has had a positive year -- with nine straight quarters of GDP growth above 6 percent. This year exports increased more than 12 percent and trade with the U.S. has also shot up than 9 percent from last year. As well as propelling forward the economy, Duterte is investing in infrastructure development. He also has an ambitious goal to push down poverty from 21 percent to 14 percent by 2022. When asked if the drug war and the economic growth go hand-in-hand, the Ambassador said Duterte's leadership has catapulted public sentiment. "Our economy is doing well because our people, the Philippine people, is much more confident in their country today. I think more than in the past years," said Romualdez.